The Impact Metrics detailed view shows a graph with the number of Views, Viewers, Comments, Likes, Shares, and Bookmarks of your content by date. It also gives you the calculated metrics, which are the global reach, impact, sentiment, and email. Use these metrics to see how your content is being received in the community. Content in private and secret groups shows viewers instead of global reach. Note: Some features described in this topic are only visible for communities which use Cloud Analytics. 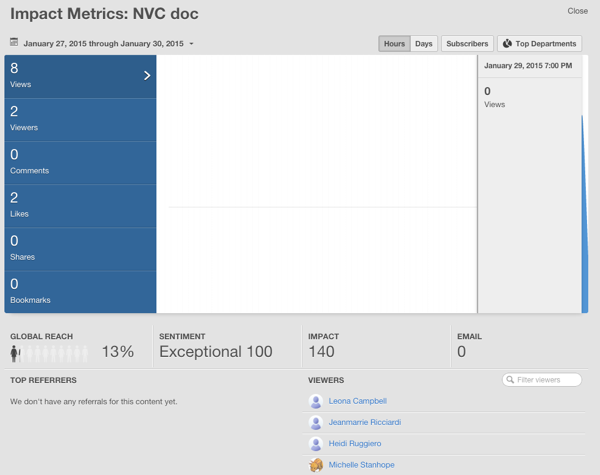 You can adjust the report dates in the upper left corner of the detailed Impact Metrics graph. Either enter a custom date range that focuses on a specific period of time, or select a pre-configured report period that shows the first 7, 30, or 60 days of publishing the content. When you click daily or hourly and then hover over the graph, you see data for more specific chunks of times. If your community has the News enabled, then you can click Subscribers to see how many of the viewers clicked through to view this content from their News stream. When News is disabled, you will not see the Subscribers button. If you want to look at which departments have the most Views, Viewers, Comments, Likes, Shares, and Bookmarks, then click Top Departments in the top right of the detailed Impact Metrics graph. Use @mention in content, comments, or replies. Reply to discussions, or comment on blog posts, videos, or documents. Create content when someone who follows you has email notifications enabled. Viewers tells you who's looking at your content, and top referrers tells you who's generating interest in it. For more information, see Who is viewing and referring your content?. For more information about Impact Metrics, see Using Impact Metrics.